Nowadays, overseas more than 170 million people love Chinese and learning it, and held on December 6, the tenth Confucius institute conference also announced the authoritative data, in 134 countries and regions in the world already had 500 Confucius institutes and 1000 Confucius classrooms, the number of students reached 1.9 million. So how the foreigners to study mandarin on the class? In addition to Chinese characters and pinyin course, feel the fresh Chinese traditional culture, is MandarinGarden teachers often arrange program for students. Calligraphy, it is necessary to appreciate calligraphy, and carefully observe the teacher writing process. 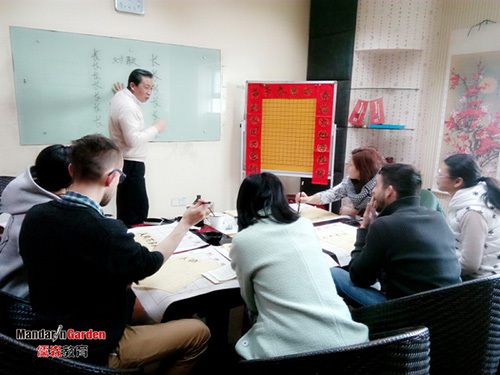 On the Chinese class, the students are compared to twenty different font and style of calligraphy, many of the students is the first time come into contact Chinese calligraphy, but they have an interest in them. How reading, how to distinguish the front and back of rice paper, what's the order of writing calligraphy works, why some words are very founder, and some words are together to looks like a music notation? Teachers' teaching method is completely in conformity with the standard of the Confucius institute of hanban, not only to analyze the differences between the western and eastern writing method and writing tools, also to introduce them the writing materials and calligraphy as an art to enhance self-cultivation and the important role of expressing personal feelings. A teacher of MandarinGarden talked about, introduce Chinese basic word , basic strokes and common Chinese characters structure to foreign people, to make them faster, and easier to understanding and learn some simple Chinese characters.